Work in Your Pyjamas? Are You Sure? - Reclusive Fox ""
Work in Your Pyjamas? Are You Sure? When I tell people I work from home they pretty much always tell me how they would love to be able to work in their pyjamas. They tell me they would give anything to avoid the daily commute and office politics and lie in bed all day. What they don’t realise is if they did work from home they would quickly get tired of wearing yoga pants 24/7 and lying in bed all day just isn’t an option. Don’t get me wrong, I love the lifestyle I have and I wouldn’t swap it for the world but just because I work from home that doesn’t mean it’s easy. I still have deadlines to meet, clients to answer to and a routine to follow. I have to put up with people assuming I do nothing all day when in truth I often put in 12 hours or more. There are the interruptions to put up with – a dad who doesn’t realise I can’t stop at any time to make him a cup of tea. Then there are the pesky cold-callers that ring all day long, interrupting my flow. Sometimes friends or even my boyfriend will try to get me to down tools to ‘hang out’. Could I do that it I worked in an office? No. So why do people assume it is okay for me to put everything on hold right then and there just because I work from home? If the work doesn’t get done I don’t get paid, I can be replaced. If I do take a break that only means I’ll be working late into the night to make up for it. There’s no clocking out here – I only stop when it’s all done. Sure, it’s okay once in a while but not all the time. Every day I am proving myself and each day I have to motivate myself to give 100%. Now I’m not going to lie, if I want to work in my pj’s I can. I could lie in bed all day long and work on my laptop but I don’t (well, I hardly ever do) and here’s why. When working at home you have to focus your brain. You need to ignore the distractions and get yourself into work mode and wearing your comfy pants and vest top doesn’t make you feel like a professional. Each day I get up, I put my face on and get dressed. It’s a process that helps me to wake up and switch from ‘at home’ mode to ‘working’ mode. I feel motivated and inspired so when I’m ready I head to the office and get to work. These days home workers aren’t as isolated as they once were. There’s a little thing called Skype that means my clients can call me at any time. Sure, many simply stick to using emails or IM’s but there’s the odd few that will think nothing of clicking on Skype and giving me a video call. Imagine how awful it would be if they called to find me slouching in bed wearing my boyfriend’s t-shirt with tangled hair. Hardly a professional look is it? Here’s a selfie I took on Wednesday morning while waiting for a Skype call. Sorry for the poor quality my boyfriend/photographer was in London at the time. I also wanted to show you a genuine shot of me in the office, not a posed one. 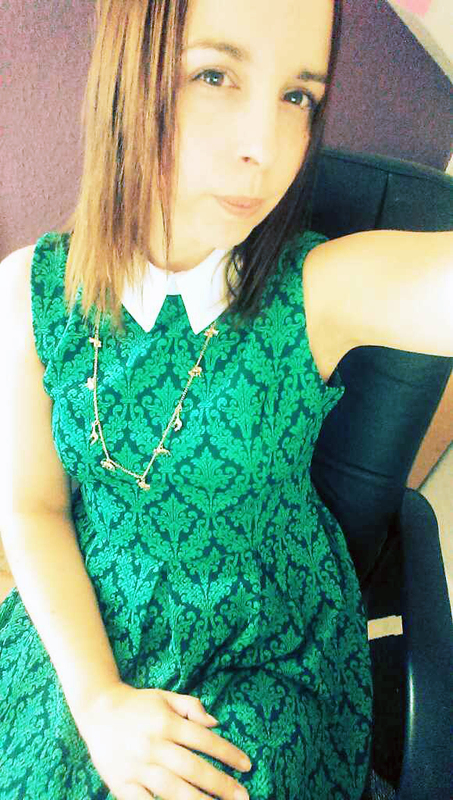 I’m wearing the cute collar dress that I picked up from New Look the day before. New Look has a sale on right now and while I was following Elle round (for what felt like hours) I saw this dress for £15 and thought it would be perfect for work. 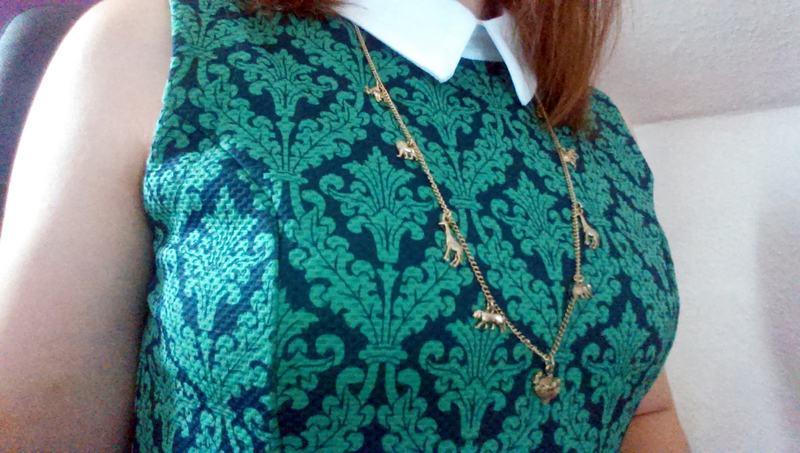 It’s also the perfect dress to wear with my And Mary Gold Animal Charm Necklace from Psyche. The necklace is on sale too, reduced from £14.99 to only £9.99. It’s got a good weight to it and it’s a great alternative to a charm bracelet (I can’t wear them as they clatter against my laptop and keyboard too much when writing). By the way the necklace would be a great gift, not only is it good quality it also arrived in stunning packaging. The other benefit of dressing up for work comes at the end of the day. It’s oh-so-easy to work all night long and to forget to relax when you’re a freelancer. The first year of freelancing I spent far too many nights working when I should have been fully switched off and relaxing. It’s not good for you. When the working day is over I get changed into my chill out clothes, shut the office door and avoid checking my work emails until the next morning. That way I find it easier to go to sleep and I get to spend time with my daughter and boyfriend without work getting a look in. Do you work from home? How do you separate your home life from your working life? I was sent the And Mary Animal Necklace to review but all my thoughts and opinions are my own. I also work from home but unfortunately I am yet to manage separating my ‘work’ and ‘home’ time. I think that’s because I have 2 kids to look after as well, and one of them is at home with me every day. Well, they both are at the mo as it’s the school hols. I’ve just introduced an alarm system for evenings though. I set it for an hour and no one is allowed to distract me during that time. At the moment everyone hates it but I’m hoping it will soon start to work as I should be able to have at least an hour where Nathan will sort the kids so I can get some work done! Lol. Wow it must be very hard with small children. My daughter is in her teens so it’s much easier these days. The alarm sounds like a very good idea. 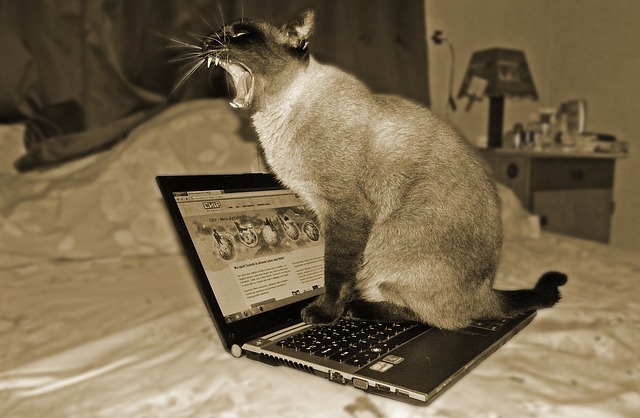 Skype is very beneficial but it can cause interruptions in itself! Great advice that I can identify with since I also work from home. It’s terribly easy to fall into the trap where you drag your feet until you realize the day has evaporated. Too, if I dress I take myself and my work more seriously. That’s another reason I don’t work on my bed, but instead have a designated “office” with a professional appearing background for Skype and photographs. Great post.